Originally, I was going to call this courgette, cherry tomato and halloumi tart, ‘Leftover Tart’, as I made it from the courgette and tomatoes left over from last week’s veg box delivery, along with the leftover puff pastry that was in the freezer. 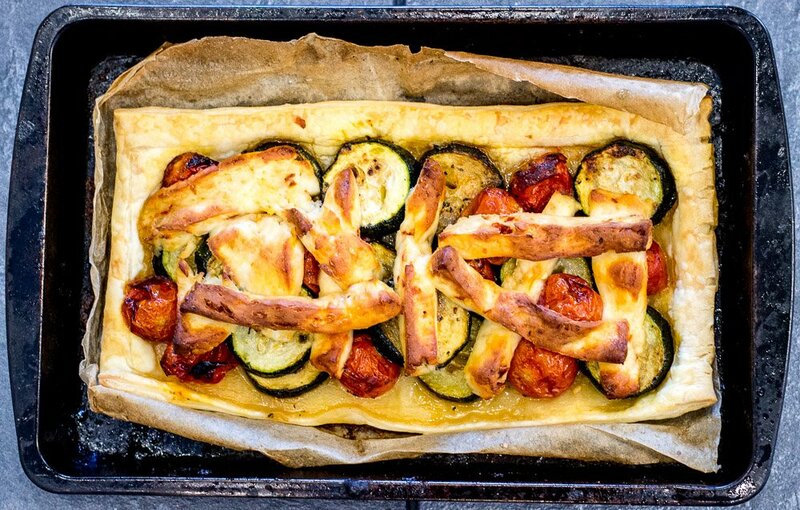 Then I realised it sounded like a derogatory term for someone’s ex, and this puff pastry tart deserves more respect than that and, while ‘Courgette, Tomato and Halloumi Tart’ doesn’t sound particularly exotic, it is at least descriptive. It was a night for leftovers, as I’d taken out of the freezer the leftover Chinese takeaway (tofu for me, chilli beef for The Meat Eater) from a few months ago, then decided not to risk my life by eating it, and made the tart instead. The Meat Eater, on the other hand, decided to risk the possibly-food-poisoning-inducing takeaway but I can report that he didn’t die in the night.